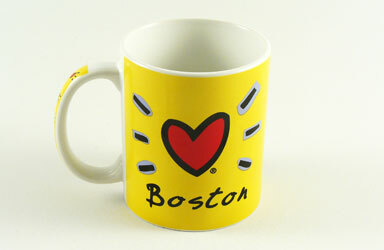 Please Note: Boston Attraction Mug is currently backordered. There may be a 3-4 day delay in shipping. Colorful Boston mug featuring attractions of the Boston area, including Boston's Faneuil Hall, Paul Revere statue, Old North Church, USS Constitution. Says "Boston" at top. On back, shown below, is "Boston" with a red heart. Yellow background. White inside. Dimensions: 3" wide, 3" tall. 11 ounces.